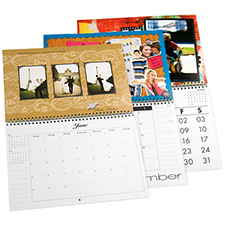 Bargain Printing offers a wide range of calendars to meet every objective and every budget. From inexpensive business card calendars to full-color glossy 28 page booklet style calendars, Bargain Printing offers quality and value. We focus on quality, small run calendars. Just bring in your images or design. Free calendar templates are also available for your use. How would you like to remind your business contacts that your business is important to them? What if they could see your logo and your phone number every time they checked the calendar? That’s powerful marketing and it’s as simple as including a personalized, custom calendar to your regular print order. Great for year-end corporate gifts and a terrific way to let your customers know how important they are to you every month of the year, calendars are becoming an essential element in creating a public presence. What better way to get your message across? You can go small and focused or go big and use every month to restate your message or to focus on different areas of your inventory, your offerings, your skills. Feeling creative? Take this opportunity to really spell it out. Seasonal promotions are perfect for calendars. Or take this as an opportunity to introduce your products in a fresh, new way. Used as a complement to your cards and letterhead, calendars are keepers.